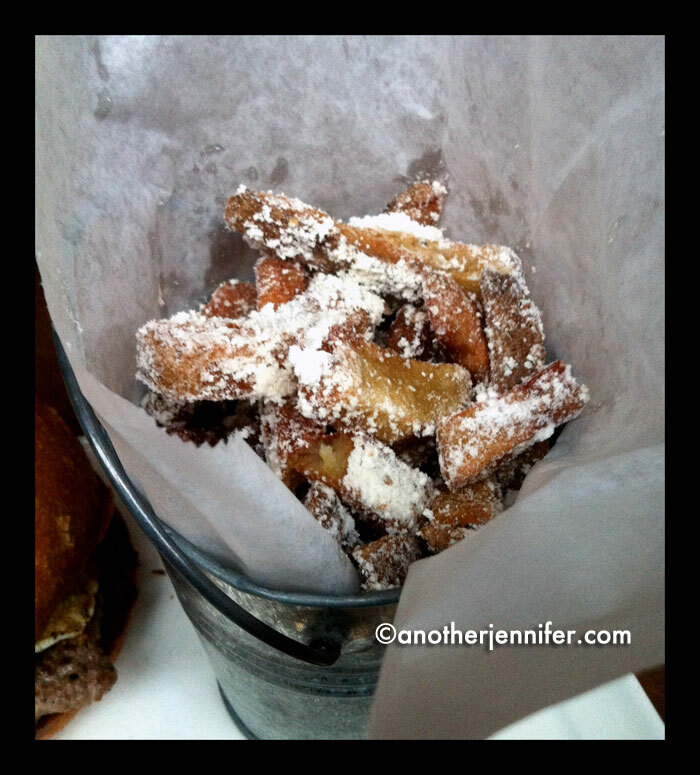 Bacon dusted fries from Nosh. Today is International Bacon Day. I’m not sure why there’s one day to celebrate bacon. I mean, it seems like we should be celebrating bacon and all its goodness every day. To help prepare for the big day, I asked my Facebook friends if they had any bacon recipes for me to share. I got some good suggestions, including dates wrapped in bacon, water chestnuts wrapped in bacon, bacon and tomato pasta, sour cream bacon chicken, bacon jam, bacon-wrapped jalapeno poppers (there’s nothing you can’t wrap in bacon) and parmesan bacon breadsticks. And then I got distracted thinking about the bacon dusted fries over at Nosh in Portland. And then I went and ate said bacon dusted fries over at Nosh along with a Nosh Burger that includes a fried egg and bacon on top. For the Bacon Dust: Preheat oven to 350 degrees. Line a tray with parchment paper, then line each slice of bacon on tray and bake for 15-20 minutes until crisp and dry. Transfer to a paper towel-lined plate and allow to cool. Crumble and put in the food processor and pulverize into a fine consistency. I’ll let you go on over to the Just a Pinch website to see her full recipe for Belgian Fries with Bacon Dust and Chipotle Mayo Dipping Sauce. But, really, I’m thinking you can sprinkle bacon dust on just about anything. How will you celebrate International Bacon Day? We have a bunch of bacon lovers in this house! I always buy the nitrate free stuff. I use it a lot too…and sometimes save the grease to use too!! Looking forward to checking out some new bacon recipes! There are some good ones in the Amazing Bacon Recipes post. My kids love adding bacon to pizza and hamburgers. Bacon makes everything taste better! I didn’t know it was International Bacon Day today, but oddly enough, I ordered some with my breakfast special this morning. It was crispy, but not too crispy, and I loved it. I saw you post this on FB and I nearly lost my mind. Count me in. Tamara recently posted..Ladies Only Blog Share Link Party: No Kids Allowed. Yes! You heard the calling of bacon this morning. 🙂 I love a good, crispy bacon. But not so crispy that it loses its taste. Yum. You are not the first vegetarian I know that makes an exception for bacon, Cyndi. It’s a worthy exception! Happy bacon day! Ha! Ashley, they are so good. You can’t not try them. Bacon wrapped water chestnuts?! Sour cream bacon chicken!! And parmesan bacon breadsticks?!?!? OH MY GOD I’m over here drooling. Do you have the recipe for the parmesan bacon breadsticks? I know, right? I should have a disclaimer that tells people they will be drooling by the end of the post. Ingre: bacon, breadsticks, parmesan cheese. What you do: cut length of bacon in half, take a slice and knead it thin thin in both directions, place in skillet, lightly fry, remove and wrap it around breadstick(like a barbershop pole), place on foil lined cookie sheet, broil 3 min to desired crispness, remove, then roll each stick in parmesan cheese, then…PIG OUT!!! Why didn’t I THINK OF THIS!!! Oh girl, I am RUNNING to the store tomorrow to get me some more bacon to bake!! And magically mash my bacon dust! Yes! I wish we lived closer so we could get together and sprinkle bacon dust on everything! I agree with you. We should celebrate bacon every day. That is why i founded http://www.NationalBaconAppreciationDay.com — where every day is National Bacon Appreciation Day!! Thanks for your suggestion about recipe of bacon for international bacon day. Can’t wait to try it, and how about add cheeses into bacon, I think it’ll be amazing!